"Now, breakfast was an additional $8.95 and was very limited." 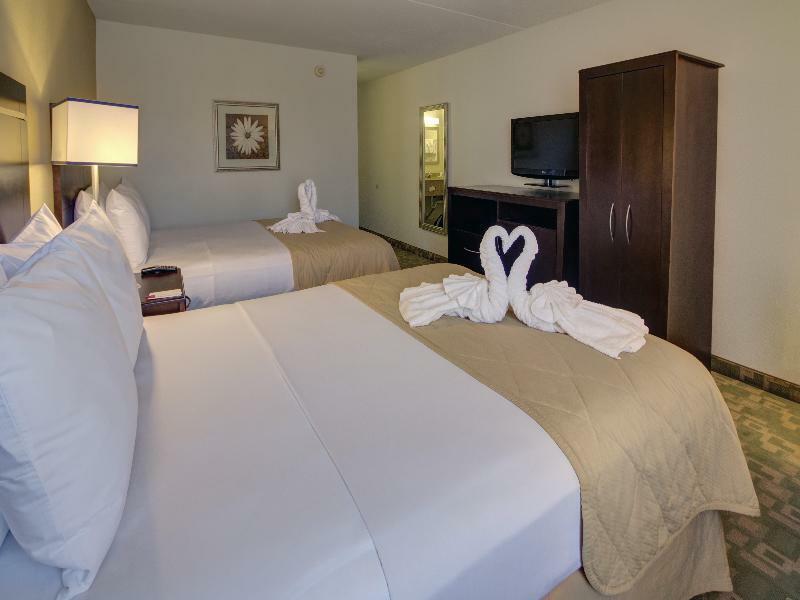 Have a question for Clarion Inn & Suites International Drive A Rosen Hotel? "The hotel is decent and has all the necessity features." 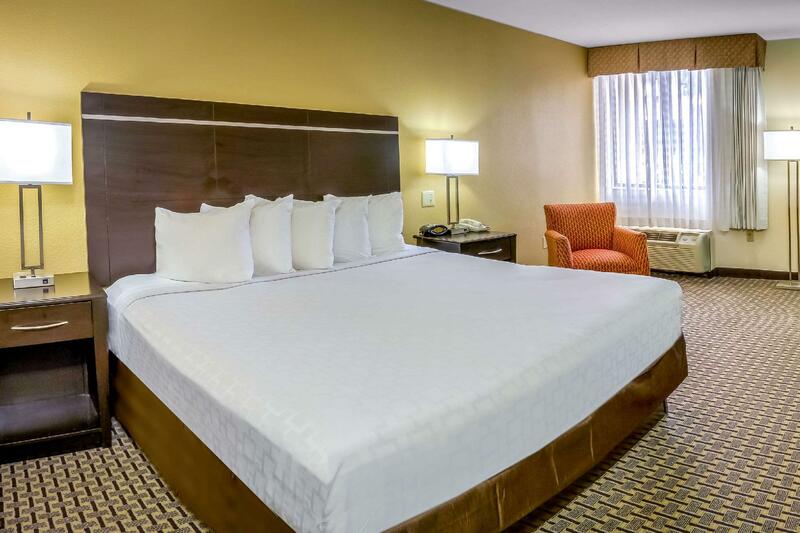 "Close to all the fast food restaurants, and next to the conv..."
Clarion Inn & Suites International Drive A Rosen Hotel is ideally located off International Drive within walking distance of the Orange County Convention Center, and just minutes from all major attractions. 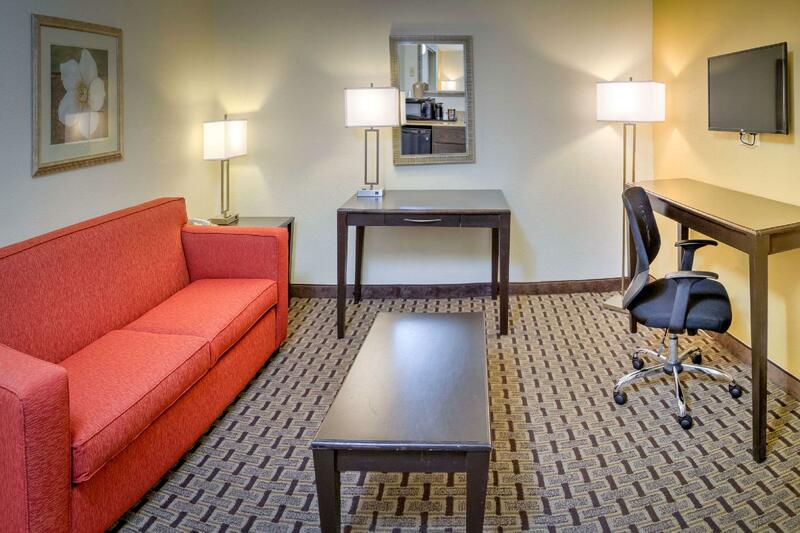 This family-friendly hotel offers modern guest-rooms equipped with comfortable bedding, a coffee maker, a hair dryer, electronic safes, TVs, and Wi-Fi access. The property offers many other facilities which help to create a comfortable home away form home, complete with a shuttle service to the area's popular theme parks and a parking area for those planning to drive independently. 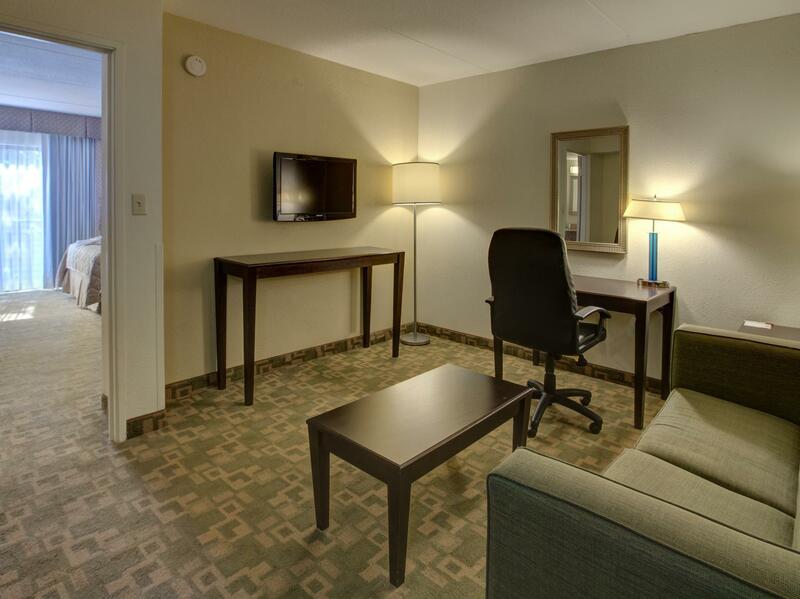 Business travelers have access to meeting rooms and high speed Wi-Fi access. Relax in the tropical courtyard, where you will find an over sized pool and Jacuzzi. The onsite restaurant is perfect for enjoying a cocktail, along with the American breakfast provided by the hotel. 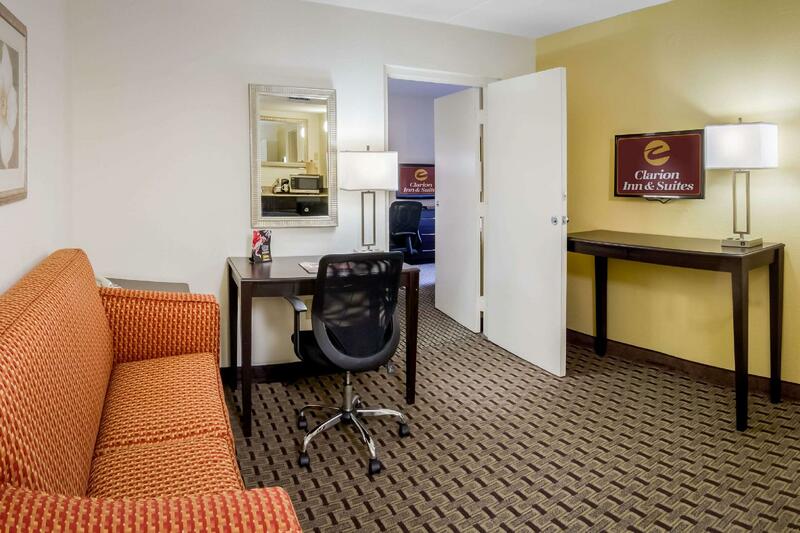 Whether in Orlando for business or pleasure, Clarion Inn & Suites International Drive A Rosen Hotel is a great choice for comfort and convenience. "Maid service was very good." After taking a long flight from California, I arrived at the hotel in Orlando, CA but could not check in. Even though I bo-oked the hotel through Agoda and showed the front desk my confirmed information. I was waited for 1-2 hours to allow me to have my room. A guy looked like the manager even asked me to book a room to rest and said he would give me a fair rate?! I had paid for the stay. It is rediculou! Staff were less than helpful - getting any kind of information was like pulling teeth for simple questions e.g: how to find my room, where to get breakfast. 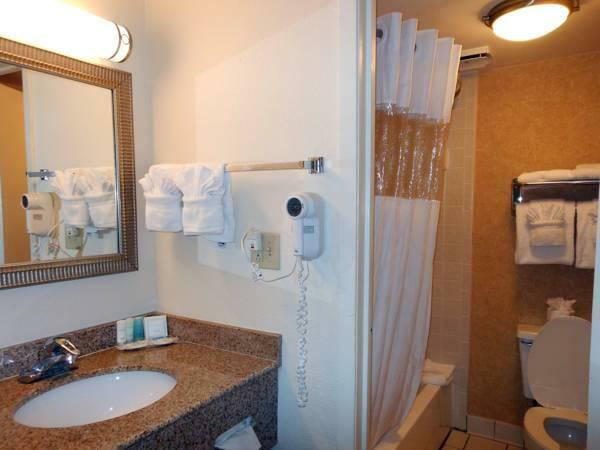 Room was generally run down - carpet peeling, tiles cracked, towel rack missing at the sink. WiFi was nearly impossible to use in my room - wasn’t able to get any work done, was lucky to manage to send a simple iMessage or Facebook message. Location was comparable to other nicer hotels in the area for walking distance to conference centre, the available food etc, so I often spent my time in other hotel lobbies and restaurants. Midpointe is cheap relative to other hotels and its definitely clear why it’s priced this way after staying there. Overall I got what I paid for I think. If the WiFi hadn’t been so difficult I would have been happier with the time I spent in my room so I could get work done etc. The staff here is rude as hell, the rooms are absolutely filthy dirty, the towels are so thin you can see thru them. We learned this hotel is about to be knocked down and lost its clarion franchise due to horrible complaints. It’s now known as midpointe as of Feb 1st. I wouldn’t wish a stay at this hotel on my worst enemy. I have stayed at the Clarion a couple of times before, and it was always satisfactory. Not great, but clean and adequately cared for. Plus, breakfast was included in the room rate. Not any more. Now, breakfast was an additional $8.95 and was very limited. The scrambled eggs weren't cooked enough, which was scary. I was sad that this hotel has gone downhill, because it's in a great location. Perhaps the owner will do some work on it (bathroom door frame in room 163) so it will appeal to more travelers. Big patch of dried blood on my sheets and they told me that they were not going to do anything about it. If your cool with broken doors, people doing drugs outside, and paper thin walls then this is the place for you. If not don't waste your money. Because they are not going to give you a refund. We didn't stay the night, we walked right out of the room and returned to the desk and asked for the transaction we made five minutes earlier to be reversed and they refused. We had a lot Of trouble with the rooms being so damp. We also found the air to be very stale. The breakfast also wasn't very healthy which we would have preferred . Nice room, the bed was comfortable. Negative was that I could hear the guy next door snoring and the shower curtain rod was coming out of the wall. There was a security guard in the parking lot the two out of the three nights I was there. Maid service was very good. This place is awful not a 4 star hotel it was not clean when we got there the staff is awful and rude and my family was not comfortable staying there at all. If you have the conference nearby OCCC and want to choose the cheap and clean hotel, this hotel is perfect. You can just walk to OCCC, which is very convenient. But, the breakfast is actually not great.. Except the breakfast, this hotel is great. it was absurdly slow to check in at night. Only one staff member worked at the front desk! Overall good. The pricing during the IAAPA convention was truly inflated, otherwise they have really good rates. Very convenient. Located within walking distance to Walgreens (24 hours), Red Lobster, Ihop (24 hours), Dennis (24 hours), and McDonalds. So whatever you need is within walking distance. In-house breakfast tends to get boring after a few days eating the same thing. All in all, good place to stay. needed a place to stay at an affordable price. You get what you pay for so don't expect any 4 or 5 star treatment. Otherwise, room / bed seemed clean. Basic continental breakfast provided. (toast, eggs, sausage, cereal, coffee, oatmeal) Iron and ironing board in the room comes handy. It was good except one day housekeeping did nothing but make my bed.